FACE: Apply Lush Nectarine to cheeks in a soft feathery motion. Use Bronze Luster to the areas where the sun would naturally touch the skin. EYES: Apply Vanilla Nut eye shadow shade to the entire lid. Blend Rouge Bronze shadow to the creases of the eyes. Define the eyes & lashes with Tight Line Cake Eyeliner in Mahogany. FACE: Apply Lush Nectarine to cheeks in a soft feathery motion. Highlight upper cheekbones with Solar Pink shade. Use Bronze Luster to contour and define. EYES: Apply Galaxy eye shadow shade to the entire lid. Blend Black Ice shade from lash line to the crease. Use Noir shade to build intensity from lid to outer corner. Define the eyes & lashes with Tight Line Cake Eyeliner in Black Ebony. 8 x 1.5 g / POIDS NET WT. 0.05 OZ. MOLTEN, MINX, BOUDOIR, SILVER STAR, BLACK ICE, CARBON, GALAXY INGREDIENTS: TALC, MICA, DIMETHICONE, OCTYLDODECYL STEAROYL STEARATE, NYLON-12, ZINC STEARATE, C26-28 ALKYL DIMETHICONE, ALUMINUM STARCH OCTENYLSUCCINATE, ZEA MAYS (CORN) STARCH, SILICA, TETRASODIUM EDTA, ISONONYL ISONONANOATE, TIN OXIDE, OCTYLDODECANOL, PCA DIMETHICONE, CETEARYL ETHYLHEXANOATE, TRIMETHYLSILOXYSILICATE, POTASSIUM SORBATE, CHLORPHENESIN. MAY CONTAIN/PEUT CONTENIR/(+/-): TITANIUM DIOXIDE (CI 77891), CARMINE (CI 75470), IRON OXIDES (CI 77491), IRON OXIDES (CI 77492), IRON OXIDES (CI 77499), ULTRAMARINES (CI 77007), YELLOW 5 LAKE (CI 19140). ROUGE BRONZE INGREDIENTS: TALC, MICA, DIMETHICONE, OCTYLDODECYL STEAROYL STEARATE, NYLON-12, ZINC STEARATE, C26-28 ALKYL DIMETHICONE, ALUMINUM STARCH OCTENYLSUCCINATE, ZEA MAYS (CORN) STARCH, SILICA, TETRASODIUM EDTA, ISONONYL ISONONANOATE, OCTYLDODECANOL, PCA DIMETHICONE, CETEARYL ETHYLHEXANOATE, TRIMETHYLSILOXYSILICATE, POTASSIUM SORBATE, CHLORPHENESIN. MAY CONTAIN/PEUT CONTENIR/(+/-): TITANIUM DIOXIDE (CI 77891), CARMINE (CI 75470), IRON OXIDES (CI 77491), IRON OXIDES (CI 77499), YELLOW 5 LAKE (CI 19140). 4 x 1.5 g / POIDS NET WT. 0.05 OZ. VANILLA NUTS, TRUFFLE, VANILLA INGREDIENTS: TALC, ZEA MAYS (CORN) STARCH, ZINC STEARATE, MICA, SILICA, DIMETHICONE, ISONONYL ISONONANOATE, CAPRYLIC/CAPRIC TRIGLYCERIDE, SYNTHETIC BEESWAX, DIMETHICONOL, TETRASODIUM EDTA, CHLORPHENESIN, POTASSIUM SORBATE. MAY CONTAIN/PEUT CONTENIR/(+/-): TITANIUM DIOXIDE (CI 77891), CARMINE (CI 75470), IRON OXIDES (CI 77491), IRON OXIDES (CI 77492), IRON OXIDES (CI 77499). NOIR(17) INGREDIENTS: TALC, ZEA MAYS (CORN) STARCH, ZINC STEARATE, MICA, SILICA, DIMETHICONE, ISONONYL ISONONANOATE, CAPRYLIC/CAPRIC TRIGLYCERIDE, SYNTHETIC BEESWAX, DIMETHICONOL, TETRASODIUM EDTA, BHT, CHLORPHENESIN, POTASSIUM SORBATE. MAY CONTAIN/PEUT CONTENIR/(+/-): IRON OXIDES (CI 77499). 3 x 3 g /POIDS NET WT. 0.1 OZ. 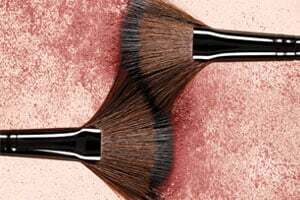 SOLAR PINK INGREDIENTS: TALC, MICA, OCTYLDODECYL STEAROYL STEARATE, DIMETHICONE, ZEA MAYS (CORN) STARCH, ZINC STEARATE, SILICA, PENTAERYTHRITYL TETRAISOSTEARATE, CAPRYLIC/CAPRIC TRIGLYCERIDE, ALARIA ESCULENTA EXTRACT, TETRASODIUM EDTA, CHLORPHENESIN, POTASSIUM SORBATE. MAY CONTAIN/PEUT CONTENIR/(+/-): TITANIUM DIOXIDE (CI 77891), IRON OXIDES (CI 77491), RED 7 LAKE (CI 15850), ULTRAMARINES (CI 77007), YELLOW 5 LAKE (CI 19140). LUSH NECTARINE INGREDIENTS: TALC, MICA, DIMETHICONE, OCTYLDODECYL STEAROYL STEARATE, ZEA MAYS (CORN) STARCH, ZINC STEARATE, SILICA, PENTAERYTHRITYL TETRAISOSTEARATE, TIN OXIDE, TETRASODIUM EDTA, CHLORPHENESIN, POTASSIUM SORBATE. MAY CONTAIN/PEUT CONTENIR/(+/-): TITANIUM DIOXIDE (CI 77891), CARMINE (CI 75470), IRON OXIDES (CI 77491), RED 6 (CI 15850), RED 7 LAKE (CI 15850), ULTRAMARINES (CI 77007), YELLOW 5 LAKE (CI 19140). BRONZE LUSTER INGREDIENTS: TALC, MICA, DIMETHICONE, ZEA MAYS (CORN) STARCH, OCTYLDODECYL STEAROYL STEARATE, ZINC STEARATE, SILICA, PENTAERYTHRITYL TETRAISOSTEARATE, CAPRYLIC/CAPRIC TRIGLYCERIDE, ALARIA ESCULENTA EXTRACT, TETRASODIUM EDTA, CHLORPHENESIN, POTASSIUM SORBATE. MAY CONTAIN/PEUT CONTENIR/(+/-): TITANIUM DIOXIDE (CI 77891), IRON OXIDES (CI 77491), IRON OXIDES (CI 77492), IRON OXIDES (CI 77499). 2 x 1.5 g / POIDS NET WT. 0.05 OZ. MAHOGANY BROWN INGREDIENTS: TALC, PROPYLENE GLYCOL, SORBITAN SESQUIOLEATE, MAGNESIUM MYRISTATE, POLYETHYLENE, POLYMETHYL METHACRYLATE, PARAFFINUM LIQUIDUM/MINERAL OIL/HUILE MINÉRALE, ALCOHOL DENAT., VP/VA COPOLYMER, TRIMETHYLSILOXYSILICATE, ZINC STEARATE, ASCORBYL PALMITATE, GLYCINE SOJA (SOYBEAN) OIL, TOCOPHEROL, PERFLUOROOCTYL TRIETHOXYSILANE, METHYLPARABEN, SODIUM DEHYDROACETATE, PROPYLPARABEN, BUTYLPARABEN. MAY CONTAIN/PEUT CONTENIR/(+/-): TITANIUM DIOXIDE (CI 77891), CHROMIUM OXIDE GREENS (CI 77288), IRON OXIDES (CI 77491), IRON OXIDES (CI 77492), IRON OXIDES (CI 77499), MANGANESE VIOLET (CI 77742), ULTRAMARINES (CI 77007). BLACK EBONY INGREDIENTS: TALC, PROPYLENE GLYCOL, SORBITAN SESQUIOLEATE, MAGNESIUM MYRISTATE, POLYETHYLENE, POLYMETHYL METHACRYLATE, PARAFFINUM LIQUIDUM/MINERAL OIL/HUILE MINÉRALE, TRIMETHYLSILOXYSILICATE, ZINC STEARATE, ASCORBYL PALMITATE, GLYCINE SOJA (SOYBEAN) OIL, TOCOPHEROL, PERFLUOROOCTYL TRIETHOXYSILANE, VP/VA COPOLYMER, ALCOHOL DENAT., METHYLPARABEN, SODIUM DEHYDROACETATE, PROPYLPARABEN, BUTYLPARABEN. MAY CONTAIN/ PEUT CONTENIR/(+/-): TITANIUM DIOXIDE (CI 77891), IRON OXIDES (CI 77499). 0.8 g / POIDS NET WT. 0.02 OZ. NOIR INGREDIENTS: ISODODECANE, SYNTHETIC WAX, POLYMETHYLSILSESQUIOXANE, HYDROGENATED POLYISOBUTENE, MICA, HYDROGENATED POLYDICYCLOPENTADIENE, HYDROXYSTEARIC ACID, C30-45 ALKYLDIMETHYLSILYL POLYPROPYLSILSESQUIOXANE, POLYBUTENE, ETHYLENE/PROPYLENE COPOLYMER, STEARIC ACID, PENTAERYTHRITYL TETRA-DI-T-BUTYL HYDROXYHYDROCINNAMATE, PALMITIC ACID, ISOCETYL STEARATE. MAY CONTAIN(+/-): CI 77499 (IRON OXIDES), CI 77007 (ULTRAMARINES).